Editor’s Note: This is a weekly column written by Meteorologist Joel Gratz that will take you “behind the scenes” of the typical weather forecast. Joel is the founder of ColoradoPowderForecast.com, where you can sign up for his email alerts. 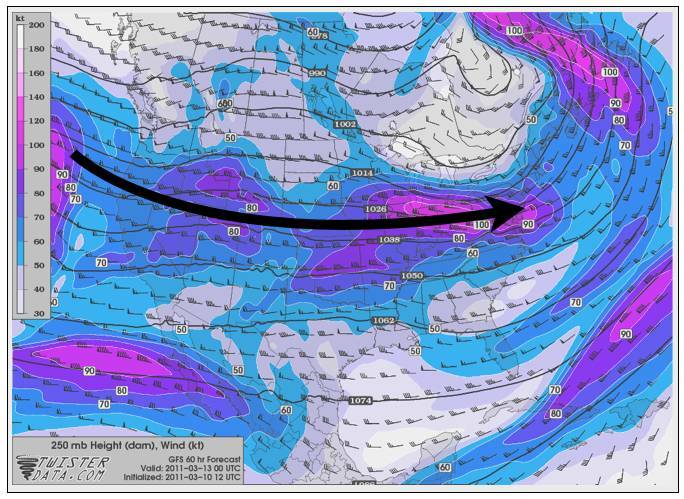 Boulder, CO – The weather pattern dominating the U.S. over the next week or so is going to be one of fast-moving, consistent storms.nSometimes the jet stream (storm track) makes big dips to the south (troughs) or bulges up to the north (ridges), and this helps to create stronger, longer-lasting storms. The next week is not one of those times. noted with the thick black line. Wyoming, Montana, Idaho, Oregon and Washington will be favored for the most snow. Areas around Lake Tahoe, Utah and northern Colorado will also see some flakes, but accumulations will be lower. This is one of those weather patterns where you’ll see just about all snow conditions in the span of a day or two. When the storms roll through, it will get colder, windier, and snowy. On the day between the storms, the sun will shine and the strong March sun will do a number on the snow surface (think spring skiing). And the next day – a new storm will roll in. Just lather, rinse and repeat! 10 days, but these forecasts are not very reliable so we’ll just have to wait and see. Joel first fell in love with weather and skiing at age four, and this passion for snow has not faded with age. After earning his Meteorology degree from Penn State in 2003 and a Masters from the University of Colorado in 2006, Joel started Colorado Powder Forecast out of Boulder, Colo., to help fellow snow lovers with accurate and entertaining weather forecasts.